Most problems on the playground start as minor conflicts. Consistent use of Rock Paper Scissors reduces these disagreements and keeps them from escalating into larger conflicts. For example, if there’s a disagreement about whether a ball hit the line in a game of four square, students play one round of Rock Paper Scissors, and the more successful player’s perspective is honored. This is a great way to ‘keep the game moving’ and resolve minor conflicts without the intervention of an adult. Rock Paper Scissors acts like a referee. Sometimes referees are right, sometimes they are wrong. Either way, referees are needed to play the game. Teach the game to students and set clear, simple rules for using it, like playing one round only. Take time to teach students how to use the tool to resolve a conflict, not just how to play the game. 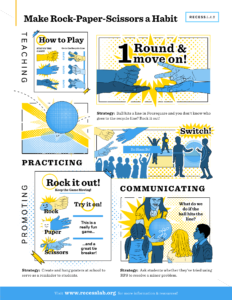 Practice making a habit of using the tool to resolve conflicts by playing games that heavily incorporate Rock Paper Scissors to determine what happens next, like Switch or Roshambo Relay. Communicate why, how, when, and where to use it. Discuss situations where the game can be used, such as deciding if a player was out during a game. Promote use of the tool through verbal and visual cues like posters, announcements, and peer or adult role modeling. Adults can also promote using Rock Paper Scissors to resolve small conflicts inside the class. For example, use it to determine which student gets to be last in line, first to the water fountain, etc. Practice by playing several rounds of Switch or Roshambo Relay (step 2). These games help create a habit of using Rock Paper Scissors to determine a path forward during a game. Identify times when you will communicate (step 3) your expectations with students about using Rock Paper Scissors. Will you gather students before recess? Will you ask students when they used Rock Paper Scissors after recess or at the end of the school day? Make a plan to promote Rock Paper Scissors during recess (step 4). 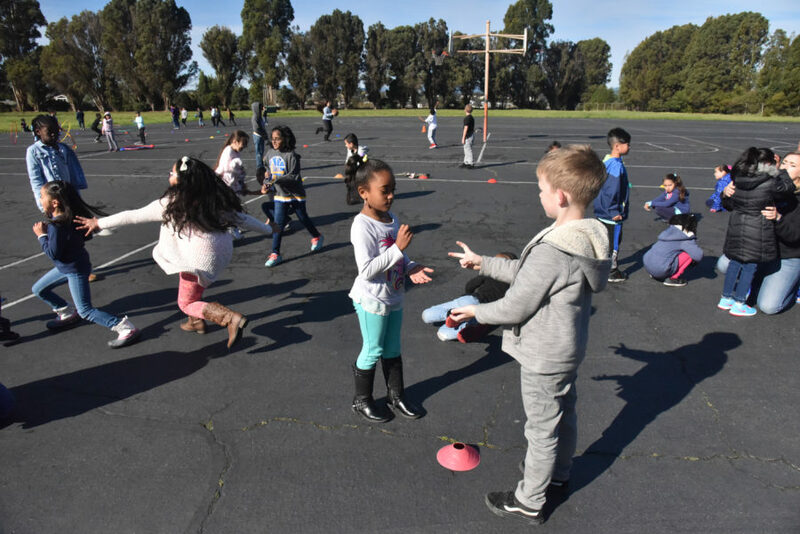 Start or join a game of four square and remind students that they can play one round of Rock Paper Scissors if they aren’t sure which player should go to the recycle line. As you play, make sure you are modeling the use of the tool as well.